Villa Ra is set on the side of a green and peaceful valley with lovely sea and hill views in the quiet, exclusive San Jaime area, 5 mins walk from the Club de Golf Ifach with its tennis courts, bars, restaurant, pool and breath-taking views and just a few minutes drive from the lovely beaches, Marina and Old Town of Moraira itself. The very private pool (1m shallow end) is not overlooked and is particularly magical at night with pretty poolside and terrace lighting. There is an open-plan living area with a fully equipped modern open-plan kitchen, a large glazed naya (sun room) and a sitting room (with UK satellite 'free-to-air' TV or German TV). Also on the ground floor is bedroom 3 with adjacent modern shower-room. Upstairs are two further bedrooms and a stylish family bathroom. The master bedroom has a balcony with those superb views over the sea, hills and pool terrace. Outside there is a shady area with built-in barbecue and steps down to the orchard garden. A best supermarket in the area is close by and there are a few bars and restaurants within walking distance. Resort area: Green countryside dotted with individual white-washed villas, shady pine woods, citrus groves and vine terracing make a pretty and relaxing setting away from the package tour crowds. Moraira is an attractive resort which retains its local charm. There are 2 safe, sandy beaches with beach-bars, and numerous little rocky coves (calas) up and down the coast. The town has grown from a small fishing village into an attractive high-quality holiday resort whilst managing to hold onto much of its authenticity . . . partly due to the busy local fish market with catches brought in fresh each day by the fishing fleet . . . if you like fish you will love Moraira! There is an abundance of restaurants, bars and smart little shops which crowd around the harbour and popular marina and then meander on down the coast road. San Jaime is on the borders of Moraira, and a little outside Town - but only a couple of minutes - and, whilst benefiting from a peaceful location, it also has the best Supermarket in the area. Suitability: Pets will be considered on an individual basis - but we'll do our best to help. Steps from street level to pool terrace may make it unsuitable for those with impaired mobility. We are happy to accept CONSIDERATE smokers and request that you do so only when outside. The villa has hot or cold a/c in the 3 bedrooms and central heating radiators to all main areas, so is warm and comfortable in Winter and cool in summer, and the glazed naya makes the most of the winter sun. Unlike some seaside towns, most of Moraira and nearby Javea's bars and restaurants remain open all year round to welcome the visitors who enjoy the temperate climate of the Costa Blanca. Winter in this area is generally sunny and pleasant. There are a few days where the rain falls, helping to keep the countryside green and fertile, but there are also days where, despite the calendar, you may well be able to get those shorts out and even go for a swim. The villa now has free Wi-Fi Internet connection for guests wishing to use their laptops or tablets. english, french, spanish, finnish, Anything that 'Google Translate' can handle! My late wife and I enjoyed many family holidays in the area with friends and eventually we bought Villa Ra between us. Every year we upgraded and improved the villa to what you see today. In 2016 I was pleased to become the sole owner of Villa Ra. When we first viewed Villa Ra we entered, as you must, through a street door and down step to the pool terrace. We were all hooked by Villa Ra before we even entered the villa, such was the magical feel and the open green views that we all experienced. It's perfect! The naya (sun room) faces south, as does the pool terrace. So both are always sunny. In winter when those in nearby villas have headed inside as the shade reaches them, Villa Ra is still sunny and warm. In addition there is an Outdoor Shower at the Poolside. We are very careful to keep our pool in tip-top condition and the poolside shower is useful for rinsing away any excess sun creams before swimming . . otherwise the water can turn cloudy. Air conditioning was installed in spring 2018 in all 3 bedrooms. It is housed in a separate utility room. By 4G. There is a limited monthly download so not for movies! Bath towel and hand towel for each guest. For long lets we supply 2 sets. Beach towels can be hired for £3.50 per person. By 4G. There is a download limit! Completely re-fitted in 2015 and has everything you could possible need. English and German Satellite T.V. are available. Planning to add Spanish soon. There is a library of DVDs for all tastes and age groups. Cards and a few board games are available. There are 110 CDs to suit all tastes. Pool / beach toys are stored in an outside room by the pool. Depending on the time or year you'll find apricots, oranges, lemons, tangerines and figs. A magical terrace area! Sunny all day and wonderfully cool as an evening place to sit and chill-out. Lovely green views and villas dotted on the nearby hillsides. Is available at the nearby Golf Club just a few minutes' walk. The Ifach Golf Club is just a 1 minute drive. The steps down from the street make wheelchair access impossible, but I have recently fitted a stout hand rail to make the stairs easier for those with limited mobility. Very secluded and not overlooked. Swimwear optional! The villa has sunbeds and parasols, and electrically operated awnings shade the naya and adjoining terrace. Two sets of doors lead from the Naya onto both Pool Terrace and Dining Patio, with further double doors onto the Patio from the Sitting Room. With all doors open the villa benefits from cooling hillside breezes and, whilst bedrooms and shower room have mosquito netting, Villa Ra doesn't have much trouble with these nuisances. This is a walled villa with entry-phone system and burglar bars. There is secure off-road parking for one vehicle plus street parking. A travel cot can be made available by prior arrangement for a small sum. The pool is 8m x 4m with a 1m shallow end and Roman steps. Washing machine, drying and ironing facilities, are housed in a separate utility room. As well as a CD Player and Satellite TV with DVD Player, we have an extensive collection of DVD titles and CD albums for your enjoyment. 3rd visit to this villa so knew to expect good time. Has everything we want - space, peace everything needed for self-catering and so on. Liked the air-conned bedroom which has been installed since our last visit 2 years ago. Pool is great. Used bbq frequently. Has main UK TV if you want it. Good WiFi. The villa is situated overlooking a relaxing view. Very clean, fully catered for all you needs and more. Perfect villa for the family to enjoy a great holiday. Thanks Scott! We always aim to please! Stayed at this villa during August 2018 - one family of six adults. It was just perfect for us with 3 x air-conditioned bedrooms, a good bathroom upstairs and smaller shower room downstairs and a safe for valuables. Kitchen is a very good size and the open-plan layout is very good for preparing meals yet still talking with each other. Plenty of everything you need in the kitchen including dishwasher and large fridge. TV very good but little used by us. There is also a washing machine. The grounds of the property are large with a very good outside BBQ at the back of the property and on the lower levels, various trees with lemon's etc on the lower level. The pool area is superb. VERY private, with sunshine (in August) the whole time & an outside shower as well as 6 good quality sun loungers and at least three sun umbrellas. From the pool terrace you have a long distance view of the sea - very tranquil. James (the owner) was regularly at the property checking the pool condition and keeping it clean and topped up. I also liked the fact that the car could be parked off road and under a good shelter and it was behind a garage door so much safer. Potential issues: The only one I can think about is if you have disabled guests / guests with difficulty going up and down steep steps. When you enter the property from the road you must go down a set of steps so you just need to be careful. There is a sturdy handrail so ok for most people. James (the owner) was easy to reach, helpful, and knows the area well. For myself I loved the area the property is in. It is a nice area, very quiet, good for running (although hilly). There are some restaurants within walking distance (try the German restaurant close by for good value and service), and the supermarket is just a few minutes away in the car with Moraira and Calpe very easy to get to. It's SO rewarding to receive comments like these! When we started letting the villa for holidays - that's nearly 20 years ago now - we were always acutely aware that we had a huge responsibility. Our guests pay good money and, for months, look forward to a dream holiday. We were determined never to disappoint and hoped always to exceed expectations. We have always had a policy of investment and our philosophy is to constantly improve Villa Ra. Every year it gets better and our guests enjoy it more. Yes, you're right, the steps down to the pool terrace from the street are not easy for anyone with a disability. Since the handrail was added matters have improved. I have a friend with serious MS who walks very badly with a stick, but she can manage the steps with the handrail as long as it's not too often. Basically if you can manage a flight of regular stairs at home you can manage these steps. Just wow!! Villa Ra was even more perfect than we imagined. It was in a superb location; the villa was immaculately clean and tidy and equipped with everything we could possibly need and so much more; there were even books, magazines, CD’s and DVD’s to borrow; the air conditioning in every bedroom was a godsend and the sun loungers were ridiculously comfy - as for the swimming pool, just wow! James was available any time to answer our silly questions, and nothing was a hassle for him. His directions and tips were invaluable and the guest book at the villa was packed full of useful information and advice on where to eat/visit etc. Easily the nicest villa we have rented. I could go on about the various features of the villa- great bathrooms, lovely kitchen, wonderful swimming pool, stunning views etc. etc. Suffice to say that my wife and I think it is just perfect. That's why we have already booked for next year! Villa Ra is a beautiful villa in a quiet location. It is well equipped and of a high standard throughout. The pool area is well thought out and feels very private and not overlooked. We had a lovely stay and will be back! 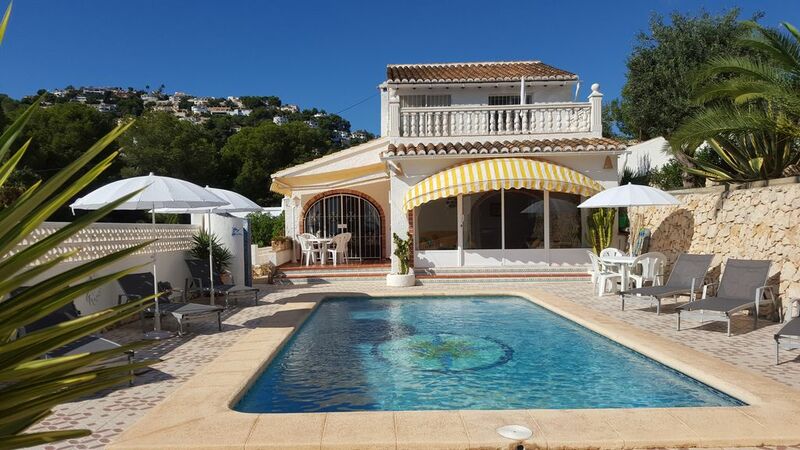 Moraira is situated on the Costa Blanca, an hours drive from both Alicante and Valencia airports, between the larger centres of Javea and Calpe. Described as The Millionaires' Playground, Moraira in fact has something for everyone - peace and tranquillity, beautiful mountain scenery, clean sandy beaches with good facilities & small bars serving cooling drinks, a lively & interesting nightlife with Tapas Bars and restaurants - some smart, plenty that are more down-to-earth, and many featuring fish dishes, especially in the port area, a couple of discos, the atmospheric Old Town area, lots of shops filled with local wares and curiosities, a weekly market...Then of course there's the Marina, with all those wonderful boats ... and don't forget the local people - who must rank amongst the friendliest in the world. SHOPS, BARS AND RESTAURANTS ARE OPEN ALL YEAR ROUND, WHICH MAKES IT AN IDEAL PLACE FOR AN OUT OF SEASON BREAK. The cancellation policy is strict to avoid those people who make frivolous bookings knowing they can get a full refund. If you are forced to cancel I will immediately re-advertise your dates and will give you a full refund for any period I can re-let. Transfers to and from the airport can be arranged should you not wish to hire a car. If you are driving and using Brittany Ferries I can arrange a 10% discount. Beach towels can be hired for your visit.